I have a Tisha b’Av confession to make. I do not connect with the idea of the rebuilding of the Temple or the coming of Moshiach. I have a hard time believing it’s going to happen. At my weekly Shabbat class yesterday, our teacher was talking with great emotion about how much we are yearning that the Tisha b’Av fast will be cancelled this year, since Moshiach will be coming. And the Temple will be rebuilt. Speedily and in our days. Speedily and today, to be more exact. “70 years ago, my great-grandfather lived in Vienna. One day some Nazis instructed him and two of his sons to go out to a forest, and dig a pit. Then the Nazis shot my great-grandfather and his two sons dead, and threw their bodies into the pits they had dug with their own hands. “If you had told my great-grandfather, standing in that forest, that 70 years later, his great-grandson would be an IDF soldier defending a country called Israel populated by 6.5 million Jews, he would never have believed you in a million years. 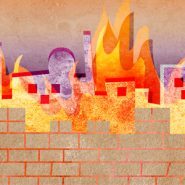 Which made me wonder, if the redemption has already started, why fast on Tisha b’Av? Why yearn for Jerusalem to be rebuilt when I look out my window at this moment and see a Jerusalem that looks quite nicely rebuilt to me. I came to hear the reading of the book of Lamentations, and sat on the floor, pretending that I felt like a woman mourning for a loved one who had died, when I didn’t feel so much at all. And then someone began chanting Aicha. And I realized that the man reading it was our shul’s devoted gabbai, Ephraim, whose son-in-law, a beloved father of 4, was brutally murdered this year in a terror attack not far from the Western Wall. I was reminded how close we are to redemption. And yet so very far. So close we can touch it, and yet so painfully, tragically far away. Especially the honesty, which seemed to have inspired a deeper look. I love it that you are always honest. Even if most people aren’t. Yep that’s why we are still mourning. Moshiach hasn’t come yet and therefore many people are suffering both with sorrows that we can and cant see. I think that much of the anxiousness and depression and self doubt that many of us experience is because we don’t have the clarity that Moshiach will bring to this world. The knowledge and awareness that Hashem is with us ALL the time and that we are loved for who we are, human beings who make mistakes but get up and try again. I’m so happy I’m not the only one feeling this way about Moshiach. Thank you for your honesty! I would never be able to put it into words so beautifully.